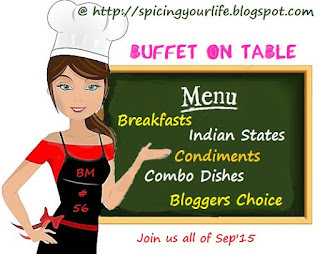 Yay, finally the last post of the Buffet on Table, Mega BM!!! pheww, never thought i would do it and here i m at the finale!!!! Thanks a ton to my BM Family, for pushing me!!! Hugs to you all!!! 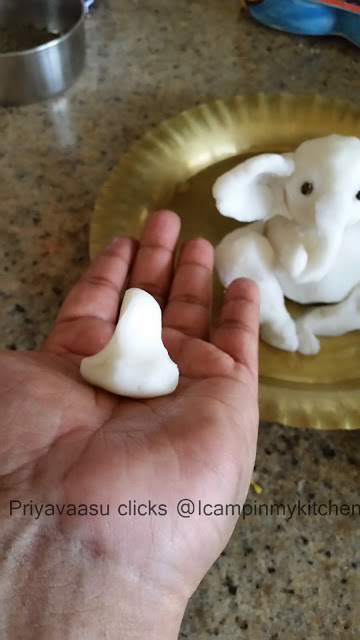 The final post on Bloggers choice, i present you how i made my first ever Ganesha, the eco-friendly way. Ganesha, the Lord of good beginnings, is here to end the September Mega BM post. 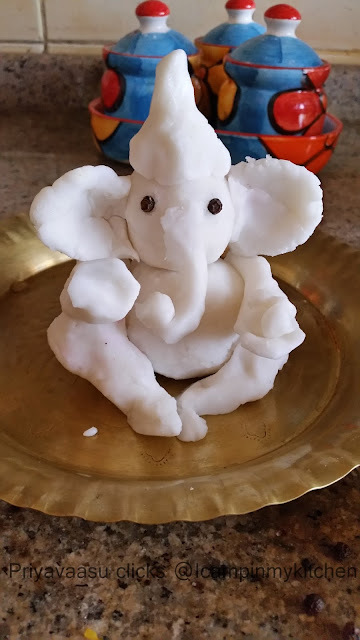 I have never attempted to make my own ganesha before, coz i know me and art stand in opposite direction. 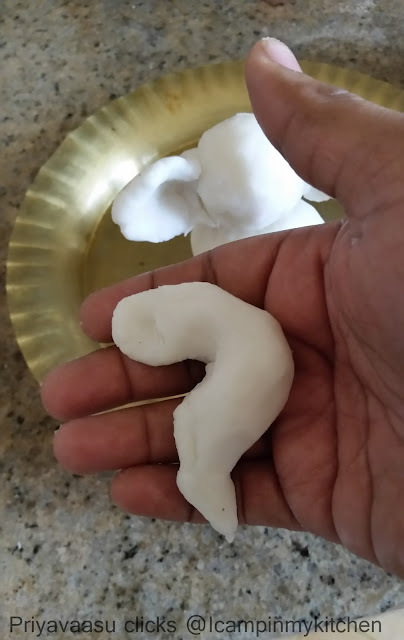 But this Ganesh Chathurthi, seeing many home-made eco-friendly ganesha's i too wanted to try one. 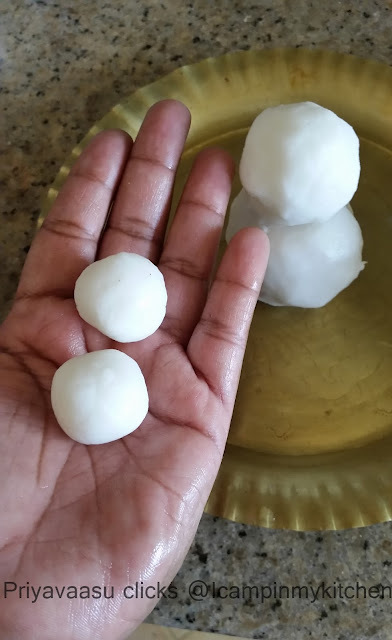 I have made mine using Kozhukattai maavu/dumpling flour. It is pretty easy to make and all u need a little bit creativity to decorate. Trust me when i say you can do it, when i have made it to look like the Lord, i m sure anybody can do it!!! 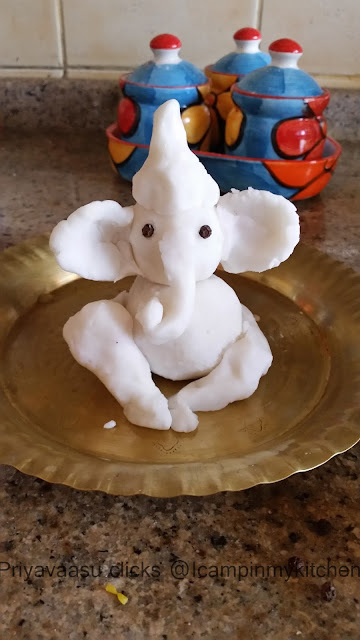 This is the Ganesha i made for Chathurthi, named him Spice Ganesha. I couldn't take step-by-step pictures that time, so i made him again today just for clicks. Hope u like it and try it for your next pooja. A bit of patience and 1/2 an hour time. 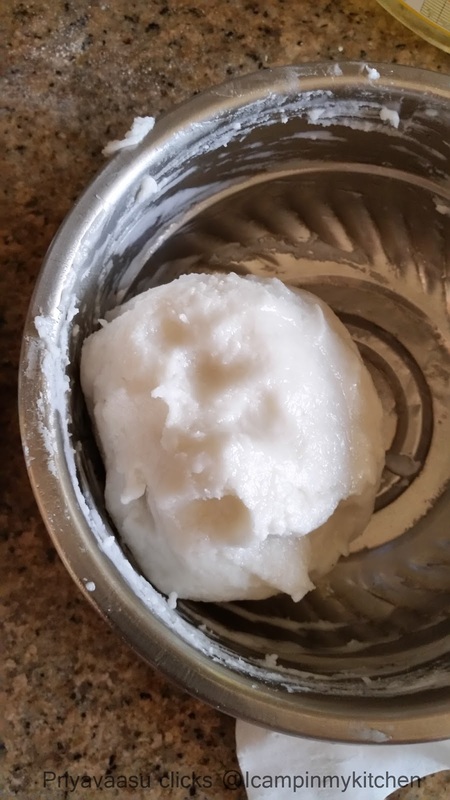 Boil water in pan, take flour in a large bowl. Add oil to the boiling water, take it off the stove and pour it over the flour, stir well using a wooden ladle. All the flour and wter should be well mixed. Keep it covered for 10 minutes. 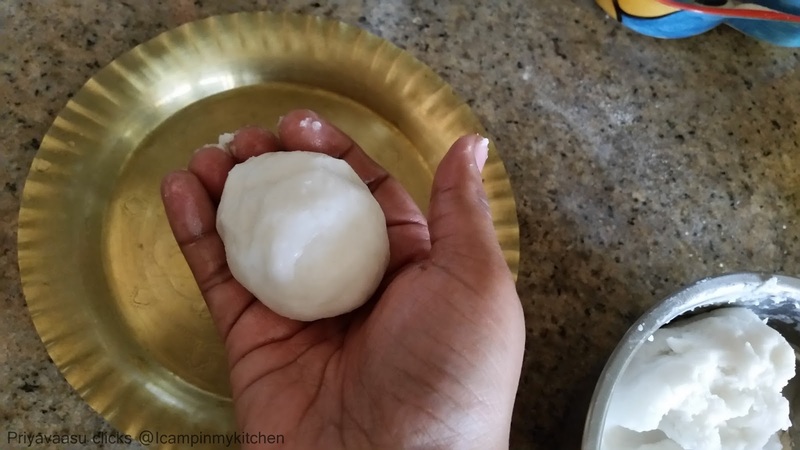 After 10 minutes, when it is warm enough to touch, collect and knead the dough into a ball. 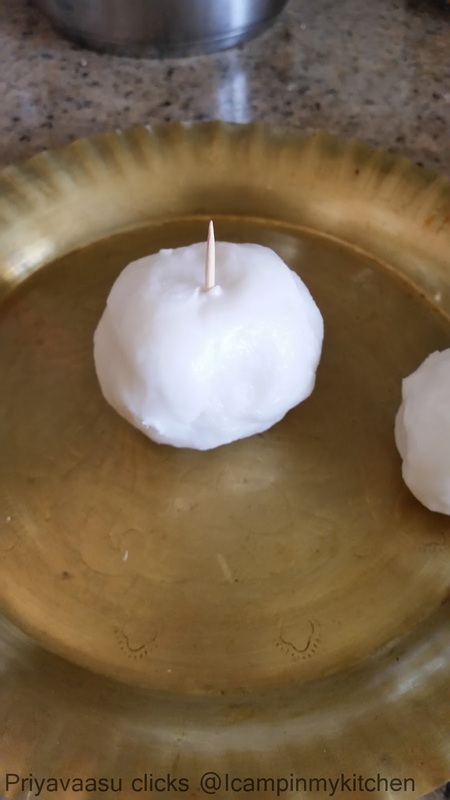 Take a clean pooja plate to place the Ganesha. Now let us start. Hope the pictures are self-explanatory. Before you start, please understand that it is a delicate Ganesha. So, please do not handle him rough. 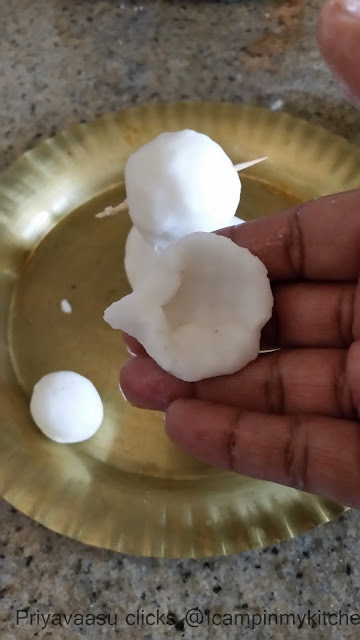 Secondly it is made of rice flour, it is suitable only for 2 day pooja, where we bid him adieu the second day, so do not try this for 5 or 10 day pooja. 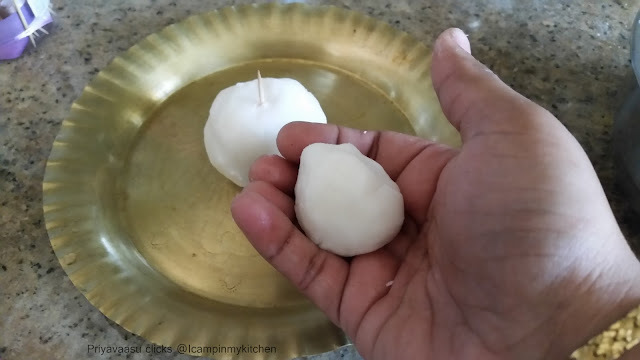 Keep a bowl of water mixed with little oil by your side, Wet your hands whenever you shape a piece of dough, slightly wet dough sticks better. Make 2 such logs of dough for the legs. Shape them like a question mark. Place one on the right side of the gnaesha like a stnading mountain and the other on the left side like a > shape. 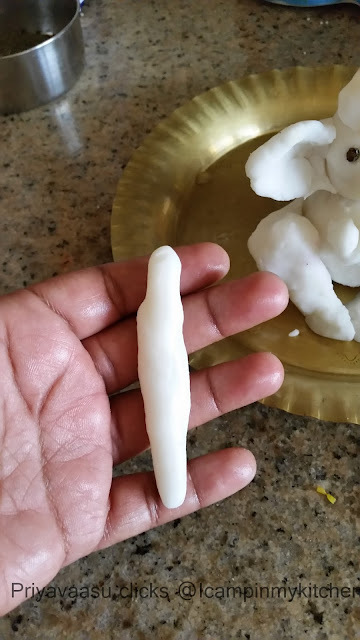 Make 2 logs like this, shape one like a spoon for the left-hand of Ganesha and other like a spoon turned other way for right hand. place 4-5 small balls of dough on the left hand, to look like he is holding modagams. 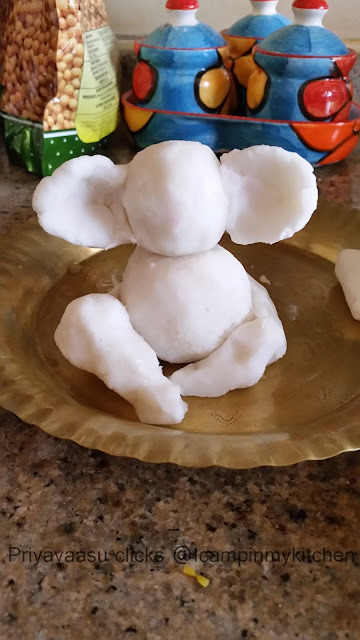 Here your Ganesha is ready, decorate him as you wish. I have used vermilion and turmeric for the decoration. Cardamom pods for the tusks ad earrings. Peppercorns for eyes. Hats off to your creativity...I could never ever dream of doing such a creative job...amazing".and kudos for re doing it. Awesome Priya , you rock...and that's why we didn't want you to miss the marathon..see you have been amazing throughout...thanks buddy ! Wow eco friendly Ganesha looks beautiful . Very innovative way to make Him.Glad you did the BM with us ,enjoyed all your posts. 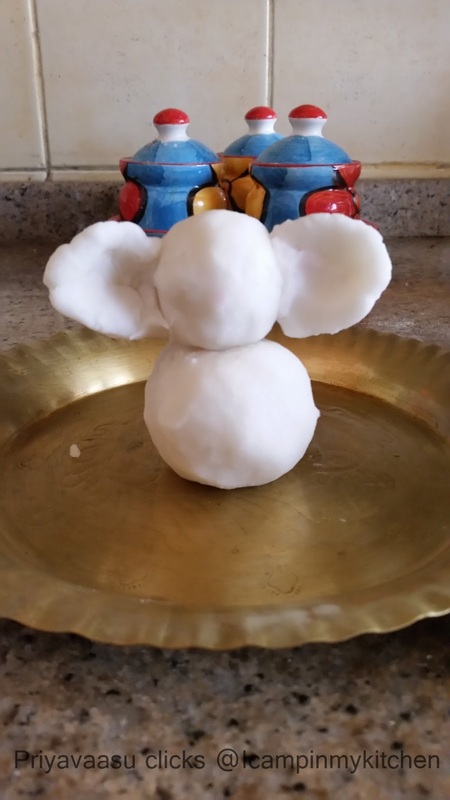 Ganesha is cute and thanks for sharing how you made it. 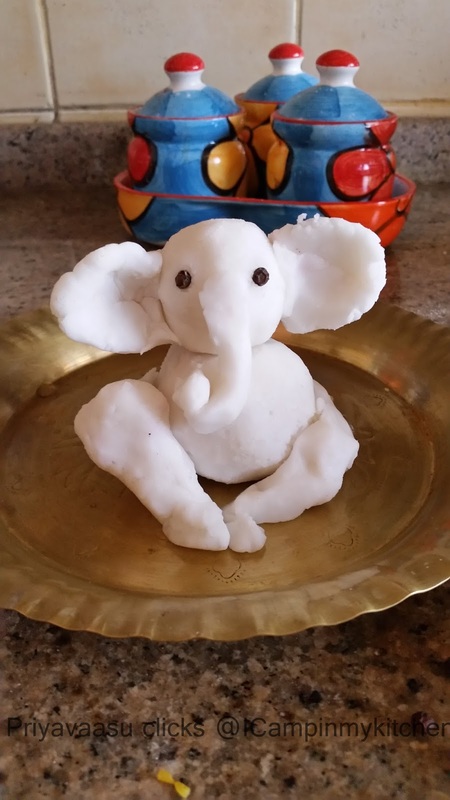 Very cute Ganesha. It was a very nice experience to go through al your wonderful posts, Priya. Your eco friendly ganesha simply rocks, and love the way u used those cardamom pods prefectly. 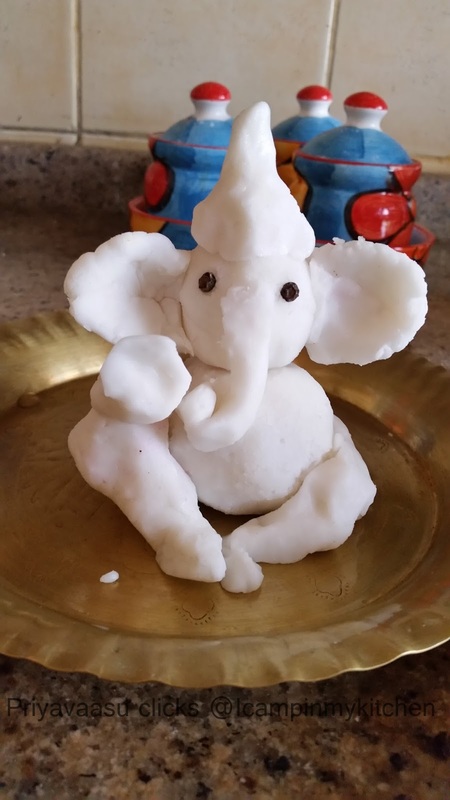 Beautiful Ganesh made with rice flour. 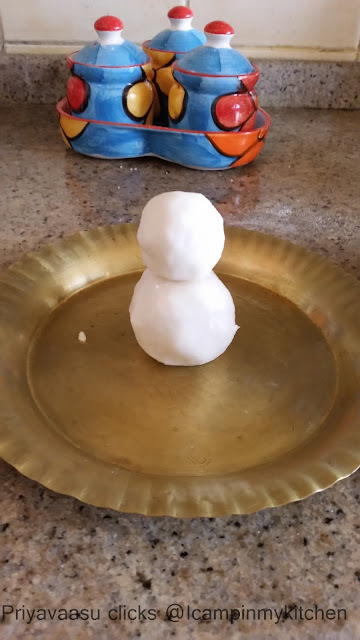 I've never made one myself but now I'm tempted to try it myself next year. Wow, Priya. 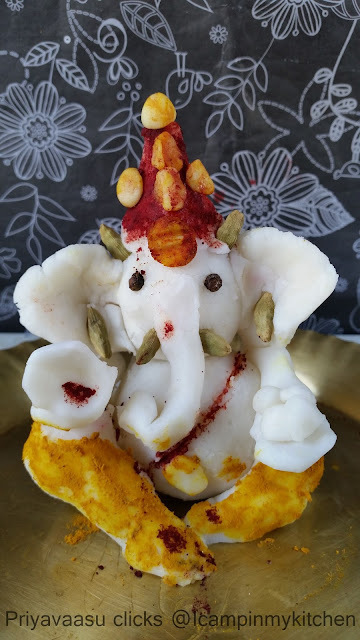 That Ganesha is pretty cute and I am tempted to try it. Thanks for the pictures which makes it easy to build it. Your spice Ganesh is so cute. I had seen him on FB and the people I showed it to we enthralled. Way to go Priya. As for art look at your pics you are extremely artistic baby.